It's OK asking for Stallions of Influence but I personally feel MARES pay a much more important part of a horses make - up. Well, the Blunt imports have to be some of the most important mares in the make-up of today's horses. 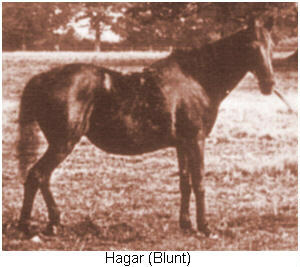 Innumerable horses of Spanish, British, Russian, Egyptian and American bloodlines trace back to these horses. Bint Helwa - her female tail line traced to Ghazieh, a seglawieh jedranieh of Ibn Sudan, desert bred. 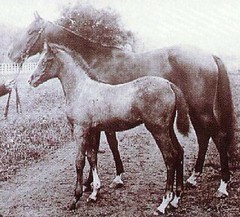 Bint Bint Nura, chestnut, foaled 1885, imp. 1897. Dajania - imp. 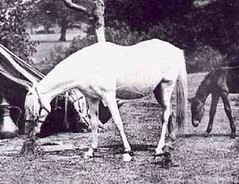 1878 - bay keheileh dajanieh, foaled 1876, bred by Mohammed Pasha. 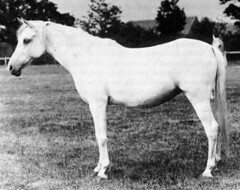 Sobha - grey hamdanieh simrieh, foaled in 1879. She was by Wazir out of Selma (not to be confused with her daughter of the same name from 1894). 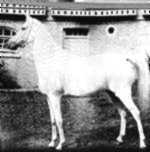 Sobha was imported 1891 and sold to Russia in 1899. 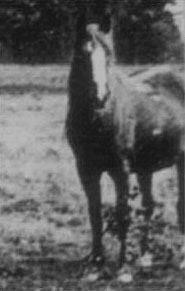 Ferida - bay managhieh hedrujieh of Ibn Sbeyel, foaled in 1886, bred by the Shammar - imported in 1891. 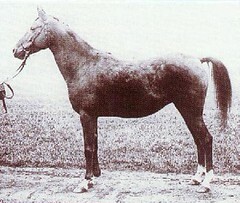 Basilisk - seglavieh of Ibn Ed Derri, foaled in 1875, imported 1878. Yes Anne and what a fantastic group they are, just think of the dynasty they have each created. 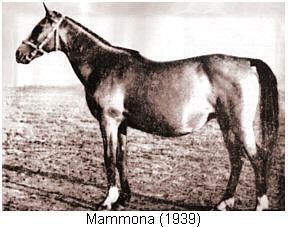 Mammona produced 18 Foals begining in 1943 at age 4. Produced each year until her death in Jan. 1961 at age 22. All of her daughters were used at Tersk but one who was deceased (Manita). This very special female walked the 1800 kilometers (about 1100 miles) from Janow Podlaski in Poland to Tersk Stud in Russia as a foal, at the side of her dam. What a dynasty she has also created. I do agree with you Jude , but the reason I started the stallions was to find the most prolific for a topic in our new Magazine, so now you have found out you wont be thinking I am doing it willy nilly! maybe we will have an article on mares of distintion next time around, meanwhile lets hear it for the mares . and of course great stallions have to have a mother and a father! Nick, it is refreshing that you have a passion for your "special mares of distinction". The thrill of seeing the offspring and choosing new mates for them is what keeps us all enthralled. I agree with you, show wins and awards are great fun but they are so soon forgotton. I stand by praising the female line - your super mare Snow Dove has a wonderful tail female line - tracing back to Bint Helwa/Helwa/Horra/Ghazieh/Ghazala - the same as Silver Scenario. Added to this El Saleem's tail female to Sobha/Selma and Imad's tail female to Dajania WOW. Hi Jude what makes her so special is the Personal stamp she as put on her "girls" They all have her little "ways"
Have emailed you, but the first one has wrong user name!Must be the forth coming new moon! Don't be tempted to use the link here it does'nt work. Wow, I didn't really know much about our mares breeding until yesterday except that we bought her as a filly when our other horse had to be destroyed. Through A/E I was able to look at her pedigree and low and behold her great, great, great grandma was Mammona - didn't mean much to me until I read your message. Maybe she is not that importent don�t know, but I would be happy to see a picture of Dafina, I know that there are one in Peter Uptons books . Also if anybody can tell me about the El Krush strain as it seems to me that they are very rare nowadays. My mares Mead and Martini has this strain as the female line. For me the Russian mare Sapina is a mare of distinction as she is in the pedigrees of so many good race horses. Her daughter Stihia produced notably sires Sambist and Artist, whilst her grand daughter Viola produced the incredible race horse Vadeer who beat so many good French breds in Dubai. Cinders would also have to get a mention as she started a superb racing dynasty, her daughter Cider With Rosie produced good race horses in Caravel and Celtus and also Champion race broodmare Cikada -dam of multiple race winners CS Comete (listed winner and owned by me), CS Al Wahed (Group 2 winner), Carrack (Group 2 winner)and CS Clarion (Diera Stakes winner). Cinders is also the great grand mother on the dam side of Padron sire of the illustrious Padron Psyche! I agree with Jude the dam line is of the utmost importance, a strong dam line is mandatory and one that has produced consistently good off spring in whatever field is an asset to any stud. Jane Kadri's foundation mare Maysuna is a great example as she produced many good race horses as well as being Res BNC including Maya, Maymunah (also won showing in UAE), Maiyza, Mais and Manisa. 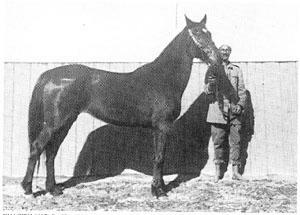 The last named Manisa produced Rawnq who won racing and is now advanced endurance and has also produced a race winner in Espace, Manisa is also the dam of my mare Barryh - who won twice and is an exceptionally good producer. One of the main reasons I bought Barryh was because she was from the Maysuna dam line (her exceptional movement, race form and wonderful temperament being the others)! Sorry these are a bit modern! When I posted stallions of influence it was in no way to belittle the dam lines which we ALL know to be very important, it was to find through study and input from all those who had input to give, THE most influential stallion of all time if indeed there was one This was to be featured in an article in our own arabianlines magazine.